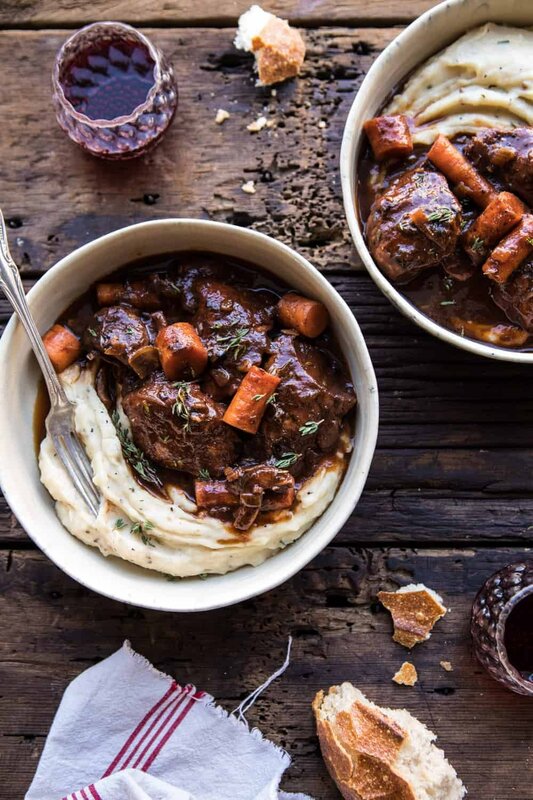 Healthier Instant Pot Coq au Vin. 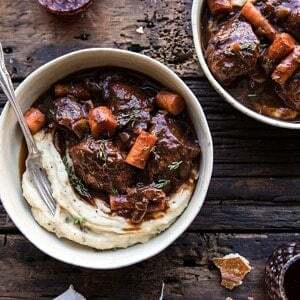 This Healthier Instant Pot Coq au Vin is for those cold fall and winter nights when you want a fancy slow braised chicken, but you want it ready in less than an hour. All made in the instant pot (or the slow cooker), using simple, wholesome ingredients that you might already have on hand. This dish is warm, flavorful, hearty but healthy, and so delicious. Great for both a simple family dinner and holiday entertaining. What better way to start Monday off than with an easier, healthier take on a fancy French classic? Especially one that involves cooking with red wine? Yes, this is a good Monday recipe. Coq au vin is a family favorite. Every time I make it, I love it more and more. Coq au Vin is the fancy French way of saying chicken braised in red wine. 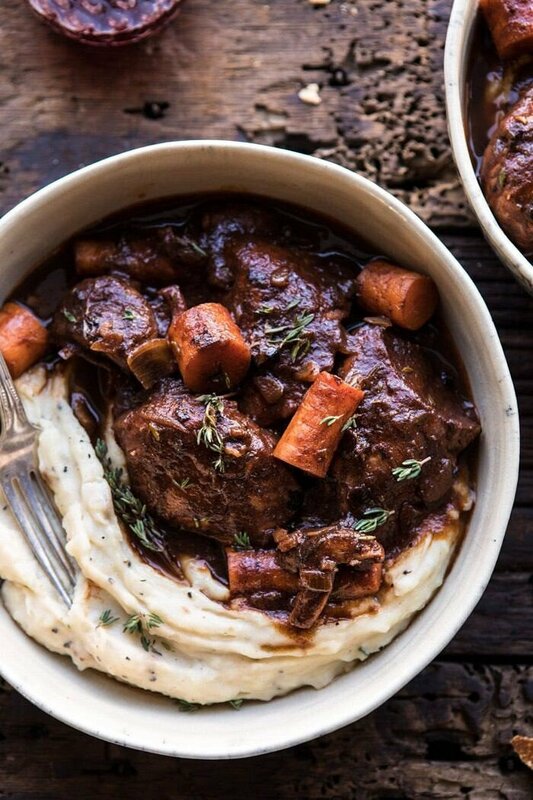 It’s a truly delicious and hearty recipe that’s perfect when served over mashed potatoes. 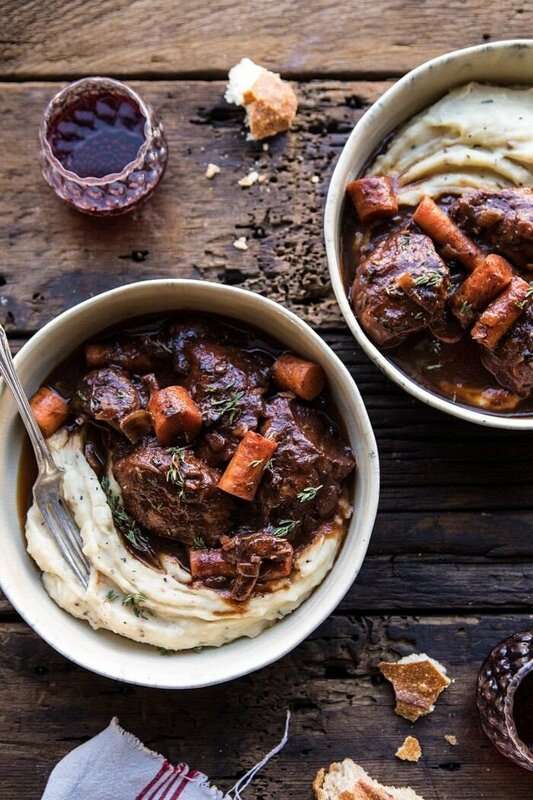 Add a side of crusty bread to soak up all the flavorful red wine sauce…la perfection! Today I’m simplifying the traditionally lengthy recipe by cooking this entirely in the instant pot in less than an hour. If you prefer to use the slow cooker I’ve included directions for that too, you choose. But by far, the most requests this past month have been for more instant pot recipes. Which is why I am excited for today’s recipe! As mentioned, coq au vin is traditionally a French style chicken that’s slowly cooked in red wine on the stove top. Some recipes require four plus hours of cooking, multiple steps, a good amount of ingredients, and a lot of hands on time. That’s all great if we have the whole day to spend in the kitchen, but I totally get that most of us just don’t. Enter this healthier, easier take on Coq au Vin that’s made entirely in the instant pot. It’s simple, it’s quick, it’s flavorful…and just oh so good. The secret? A little bit of bacon, red wine, and plenty of fresh thyme (fresh herbs are my current obsession). Here’s how you make it. You ready? It’s simple. Cook up the bacon and get it nice and crisp. Add in the onions, garlic, and tomato paste, cooking until fragrant. Then add the wine, chicken and herbs. Cover and cook for a bit. In about 20 or so minutes, you’ll be done. I know it sounds too good to be true, but I promise, it really is this simple. Traditionally, coq au vin is made with whole chicken pieces. I used chicken breasts, which not only cook up quicker, but are also a lighter choice than skin on dark meat. The red wine helps to keep the chicken from drying out. The instant pot cooks the chicken until it’s perfectly tender and tastes as though it’s been slow cooked all day long. It’s going to seem like a lot of wine to use, but trust me, it’s going to be great. The wine is the heart of the recipe, providing flavor while also helping to tenderize the chicken, so don’t skip it. Highly recommending these mashed potatoes and a crusty side of bread. And for anyone looking for a simple stove-top version, check out this recipe. If you make this coq au vin please be sure to leave a comment and/or give this recipe a rating! Above all, I love to hear from you guys and always do my best to respond to each and every comment. And of course, if you do make this recipe, don’t forget to also tag me on Instagram! Looking through the photos of recipes you all have made is my favorite! For those cold fall and winter nights when you want a fancy slow braised chicken, but you want it ready in less than an hour. All made in the instant pot (or the slow cooker), using simple, wholesome ingredients you may already have on hand. 1. Set Instant Pot to sauté. Add the bacon and cook until crisp, about 5 minutes. Remove the bacon. If there's excess bacon grease, drain off all but 1 tablespoon. 2. To the instant post, add the onion, garlic, and tomato paste and cook an additional 5 minutes. Turn the instant pot off. 3. Add in the red wine, chicken broth, bay leaves, thyme, chicken, carrots, and mushrooms. Season with salt and pepper. Cover and cook on high pressure for 15 minutes. 3. Once done cooking, use the natural or quick release function. Set the Instant pot to sauté and bring to a boil, boil 5 minutes or until the liquid reduces slightly. Turn the instant pot off. Remove the bay leaves and thyme and discard. Stir in the parsley and reserved bacon. 4. Serve the chicken and sauce over mashed potatoes. 1. Cook the bacon in a large skillet over medium heat until crisp, about 5 minutes. If there's excess bacon grease, drain off all but 1 tablespoon. 2. To the skillet, add the onion, garlic, and tomato paste and cook an additional 5 minutes. Remove from the heat and transfer the mixture to the bowl of your slow cooker. 3. To the slow cooker, add in the red wine, chicken broth, bay leaves, thyme, chicken, carrots, and mushrooms. Season with salt and pepper. Cover and cook on low for 6-7 hours or on high for 4-5 hours. 3. Once done cooking, cook, uncovered on high for 15-20 minutes to reduce the sauce. Remove the bay leaves and thyme and discard. Stir in the parsley and reserved bacon. 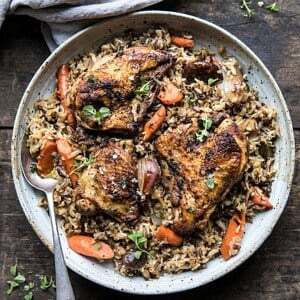 One Pan Autumn Chicken and Wild Rice Casserole. Slow Cooker Herbed Chicken and Rice Pilaf. 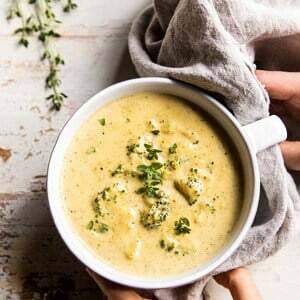 Instant Pot Broccoli Cheddar and Zucchini Soup. 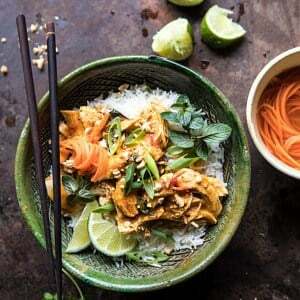 Instant Pot Thai Lemongrass Chicken. 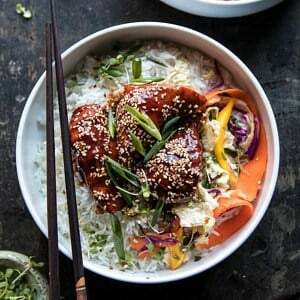 Instant Pot Sticky Korean Chicken. Yum, I love a good coq au vin!! Do you leave the chicken breasts whole or cut up on pieces? Oh my, this looks divine Tieghan! It’s getting very cold recently, and a warming meal like this would be absolutely perfect for tonight. I’m sure turkey breast will work too? Do you mean to use skinless boneless chicken breasts? Would skin on bone in chicken breasts add more flavor? Oh my gosh this looks amazing. I’ll definitely try to make it this week. I’m getting an Insta pot for Christmas so in the mean time I’ll use my crock pot. Thank you for including the slow cooker directions too! The mashed potatoes are on my list for Thanksgiving! What a genius idea!! Thank you so much Kristen! I am so glad you love this! Hi Tieghan, happy to see another French recipe! It makes me smile because we make less and less of these traditional dishes here (the new generation is more into world food, which came pretty late on the market) but we love it when our grandmothers cook this for us! The traditional recipe calls for rooster, marinated in wine the night before (but as you mentioned it, we want quick recipes!) Not sure you have this in the US, chicken will do fine but I personnaly think chicken parts with bones, or a whole chicken cut up, will stay togeher and be tastier than breasts. Bon appétit ! I am so glad you like this Anaïs! I hope you make this! This recipe looks delicious – can’t wait to try it! One question: do you leave the chicken in the pot when reducing the sauce? I am worried they will be over cooked if you do. Thanks! Can’t wait to make this, but I will. This will be my election night dinner. I’ll go with bone-in thighs.and also add a chopped large shallot. Perfect. Thanks for the Instanr Pot recipe. I hope this turns out perfectly for you Joyce! Thank you so much! Could you please suggest a savory substitution to the bacon (as I do not eat pork )? Turkey bacon? Would that work? But I would prefer not to use any bacon or bacon like products. Thank you. It would be greatly appreciated. And again, thanks for all your contributions! I love all you share. This looks fantastic!!! Do you think this would be safe to consume while pregnant? (cause of the wine?) Does the alcohol “cook out” when covered in an Instant Pot? Hi Catherine! From what I have read the alcohol may or may not cook out all the way in an instant pot. I am unsure, so I would not suggest eating this while pregnant. I hope you love some of my other recipes! Can’t wait to try this recipe today. Do you cut up the chicken or put the whole chicken breast in the slow cooker? Thank you and for sharing your delicious recipes. Major MAJOR high fives Tieghan – this looks insanely delicious!! I have the same question as Jeanne from the other day: does One remove the chicken before reducing the sauce? Jeanne, I’m taking the gamble and will remove a piece and check it. If it seems cooked (which I think it will be), I’ll be removing all the chicken. Nothing worse than overcooked breasts; except maybe not getting an answer from the chef, harummmph. 😆. When you reduce, as someone else asked do you leave the chicken in the pot? Also do you do this without the Instant Pot lid on? This may seem like a silly question, but I am not a very good cook, so for me I need the specifics. Love your blog site and the recipes! Hey! First of all I’m a huge fan! You’re amazing!! I made your coq au vin recipe for dinner and it was AMAZING! Thank you so much!! Looking forward to more of your art work! I made this tonight as I was looking for an Insta Pot chicken recipe and this came in my email! It was easy and delicious. I had bone-in skin-on chicken thighs which I browned before adding. I opened a Round Hill cabernet (inexpensive), and used shitake mushrooms because I had them. We served over rice!Don’t miss the last step (I removed the chicken to simmer sauce down and on my insta pot, I used ‘saute’). That 15 minutes turned the sauce into velvety goodness.We all loved it here! My only other advice was use bacon you love…my bacon was very smokey which went well with this dish, but next time I might try a less smokey bacon! Thanks again, Tieghan! Thank you so much Liz! I am so glad you loved this recipe! Made this tonight with ingredients on hand (Thai rice noodles, carrots, julienned snap peas) and it was very tasty, Jen. Mr Fussy was pleased! (And he lives up to his name…) Same goes for the Bang Bang Shrimp I made last week. Keep those great flavors coming! I will look for the Korean noodles for next time. I will share this on my FB page. I am so glad you enjoyed these two recipes, Marlene! Thank you so much! PS. to everyone, this comment was not intended for this recipe! Oops, my prior comment was for another recipe and accidentally posteed here instead.So sorry! Maybe Tieghan can delete it. I don’t have an instant pot so appreciate that you include alternative cooking options. I’ve only one Coq au Vin with bone-in chicken parts so lookk forwaard to tryiing this version. Hi Marlene! No worries! I hope you love this recipe when you try it! I am so glad this turned out so well for you Dianna! Thank you so much! Wow that is so amazing! I am so glad you and your family loved this recipe, Eileen! Thank you! This looks delish! We don’t drink, so I wonder if you could suggest a wine substitute? I’ve heard some use balsamic vinegar, but figured I’d ask. Thanks! Hi! If I did this in my crockpot in the oven what would I cook it on and for how long? Looks delicious!! I made this Halloween night and it was perfect! I put it in my slow cooker before I left that evening and kept it on low until I came home. I used bone-in chicken quarters and browned them before sautéing my aromatics. The chicken was falling off the bone and the sauce was rich. I quickly made mashed potatoes and was done. It was wonderful to have a delicious warming meal after being out for the night! Thank you for the recipe! I am so glad you loved this recipe and it turned out amazing for you Marie! Thank you so much! Would it be ok to substitute pancetta for the bacon? If you are concerned about making sure the alcohol is cooked off, add the wine after sautéing the onion, garlic & tomato paste mixture. Leave the pot on sauté function, and cook until the wine is evaporated. Then turn the pot off and proceed with the remainder of the recipe. Thank you for this Diane! I am sure so many will find it helpful! Hi! I trust everything you do so would be interested to know what kind of insta pot you have? I believe there are several brands. Thank you! Hi Beth! I have the Instant Pot brand and it is 6 quarts. I will link it below! This looks so amazing! I just bought an instant pot and have been trying to familiarize myself with it and find some good recipes. I have some bone in skin on chicken breasts and chicken thighs i was planning on using. Would the cooking time need to be increased if I use them? I made this on Friday and it was so yummy!! However, the sauce didn’t really thicken. It was a little runny. Any tips on how to make it a bit thicker? I would like to double this recipe for our family dinner. how long would i need to cook it in the instant pot if i double it? Hi! How large is your instant pot? Doubling will effect the outcome of the dish. I am worried it could turn too liquidy if your instant pot is smaller. I am so happy to hear that! Thank you Murielle! Hello ! I ran into your Instagram account today with this recipe. I was so hungry I didn’t even wait for the whole thing to reduce. The flavors blended so well, I’m impressed. Will be following your Insta and blog now! Welcome! I am so glad you found this recipe on my Instagram and loved it Evelin! Thank you! Hi, we enjoyed this recipe, good flavor. One question-my sauce was not thick at all, it seems thicker in your photos. I cooked in slow cooker and did let it cook open at the end, turned on high. Sauce reduced but still was very liquidy.Any recommendations? This tasted great. It did not thicken much after the 5 min boil so I added 1 T of cornstarch flurry to the liquid which helped a bit. I used a Spanish Rioja vs Cab as I had some open. Served on parmesan mashed potatoes. Thanks for an easy tasty instant pot recipe. Fitting for company. Hi Danita! I am so glad to hear that you and your guests enjoyed this recipe! Thank you! This is so good! I made it for dinner guests last night and everyone loved it. I served it over mashed potatoes and it was perfection. We have a mushroom allergy so I subbed eggplant in their place. Thanks for this recipe, it’s a keeper! YUM! I am so glad you and your guests loved this recipe, Liz! Thank you so much! I am so glad you loved this! Let me know how you and your boyfriend like it with beef, Rachel! Thank you! Hi Tieghan! As I don’t have an instant pot (though I think it may be time to invest in one!) I’ll be using a slow cooker, so I was wondering if you had found cooking it low or high yielded better results? 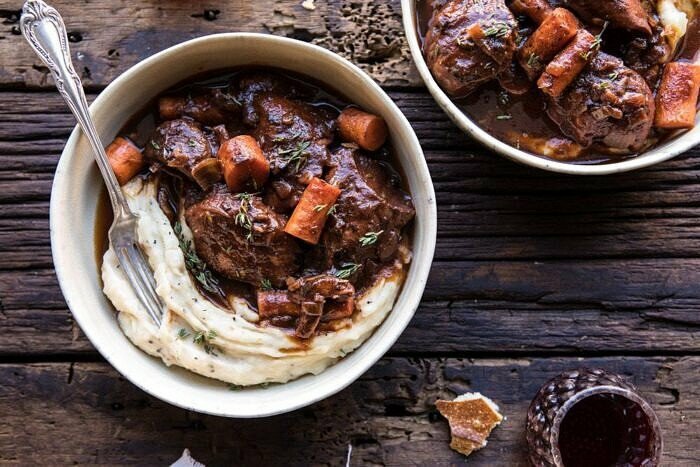 If you have any other slow cooker tips that would be wonderful!! Do you add the bacon back in at some point or is it used just for the grease? I wanted to stop by and say that my whole family enjoyed this meal! My only question is, I followed the recipe exactly (instant pot version) yet it did not seem to have the same “thickness” as portrayed in your photographs. I even added a few more minutes to the reduction portion. Any tips or ideas? I prepared as directed with the exception of using boneless, skinless thighs. I sauteed for 8 or so minutes and it never reduced by much and the chicken pieces totally fell apart; I was afraid to boil for much longer. I was disappointed to not have a silky sauce but lots of liquid. The flavor was good but not near as pretty as yours. Thoughts? BTW, your turkey and white bean chili is in the crock pot as I type! Thanks! HI! The chicken feel apart because thighs have more fat and fall apart easier than breast. First of all, I don’t generally comment EVER on food blogs after doing a recipe. Maybe because it’s not usually worth commenting about. However, this is the first recipe from your blog I’ve tried (my boyfriend is French and I wanted to make him something comforting with the holidays coming up and his first holiday since his mom passed away over the summer). So I was thinking “Coq Au Vin” generally can be made in a slow cooker — and seemed like the easiest meal to make out of all the French meals lol. I was hoping this would turn out good and of course was doubtful, but good is an understatement. This recipe came out AMAZING! I just tried it this morning and I can’t stop dipping pieces of the baguette (I bought for him 😅😂) into it. I am so excited to give it to him tonight! Thank you for providing such a wonderful, simple and incredibly delicious recipe. I stopped cooking for a while (because of a new job I started), but after making this, I feel invigorated to try so many more of your recipes! WOW I am so glad you like this and I hope he loves it as well! Thank you so much!! I am so glad I found your blog! Made the crock pot version of this today and it was delicious with mashed potatoes and broccolini. Thank you! I am so happy to hear that Allison! Thank you so much! First off, coq au vin is not chicken. It’s rooster. Or a tough free range chicken. Which is why it needs the longer time braising. It’s a tough bird. Second, chicken breasts are not made for braising. You can submerge them in whatever liquid you want, it won’t keep them from getting stringy if you cook them for more than a few minutes. Third you use bacon. Replacing thighs with breasts in a dish that has bacon doesn”t make it healthy. It’s just as fat. But good pictures, which I guess is the only thing that matters. Hi Mark! Thank you so much for this! It is really important to me that the recipe is delicious and I hope you try this out to see! I’m a single gal in law school and I am always looking for fast, delicious recipes. This dish was INSANE! So damn good and definitely reminiscent of the dishes my French grandmother used to make me. Well done!! Hi Nicole! I am so glad you loved this recipe and it worked really well for you! Also, I hope law school is going amazing! This looks so delicious! Do you think it would work with turkey breast instead of chicken? Love this recipe! The only thing is that you didn’t state to remove the bacon after cooking, even though the last step says to stir in the “reserved bacon.” I made it with the bacon in the IP the whole time, so we will see how it turns out :/. Fingers crossed it’s not a bunch of soggy bacon! Hi Christina! How did it turn out for you? I hope you still liked this! Thank you! what if you don’t use alcohol…what do you recommend as a replacement for red wine? Hi, if I cook with chicken thighs how much time should j adjust the IP for? Thank you! Yummy recipe! I didn’t have wine, so I just used chicken broth and a little wine vinegar, but it didn’t turn out as thick as yours looks. Is the reduction effect something that only happens with wine/cooking wine specifically? CRanberry or pomegranate juice sound a yummy—-I will have to try that next time! Thanks! I’ve wanted to try making coq au vin for a while and this was definitely an easy way to try it! I used the crock pot version of the recipe and, to my husband’s disappointment, I left out the mushrooms because I’m not a fan. It turned out so well and was so delicious! I served it with the brown butter sage mashed potatoes on your other coq au vin recipe. Thank you so much Brenda! 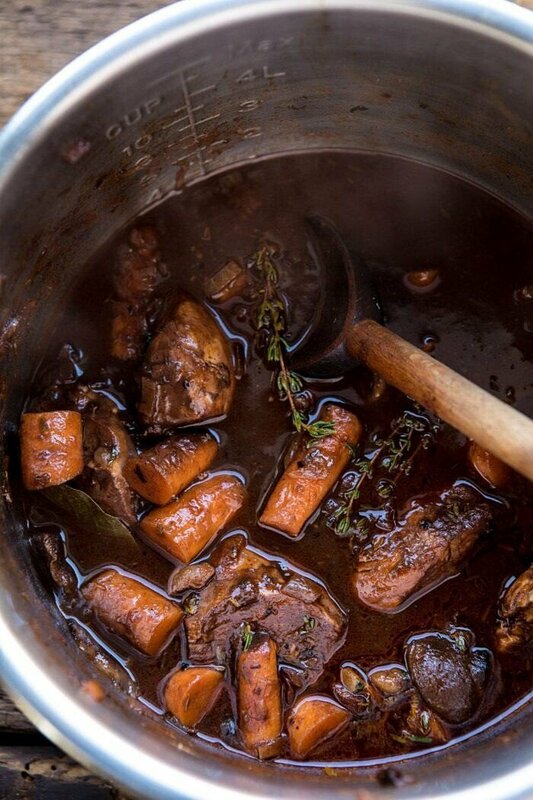 I am so glad you loved this recipe and you were able to try coq au vin! i’m making this for a christmas party & i’m hoping to get 7 servings (i’ll take a small one for me 😉 ). how did you prep your chicken? was it two large breasts that you cut into pieces for serving? i can’t tell from the photos or directions & i’d love you input. i don’t want to get thinly sliced breasts if it’ll cook weird, or tenders for the same reason! How much time would you add if the chicken is frozen? I tried out my shiny, new Instant Pot for this recipe, and it was a marvel. The chicken was so tender! Thanks for creating and sharing! I am so glad this turned out so well for you Beth! Thank you! I just posted that I made your Coq au Reisling for my husband over Christmas. I tried this one last night in our new slow cooker. it was just as delicious! Hubby like the Coq au Reisling better but that’s probably because it was far more rich with the cream in it. 🙂 In my particular slow cooker, I could have used less liquid. It didn’t reduce as much as I would have liked. I’m sure all slow cookers are a smidge different so I’ll just make a note to reduce the liquid by a 1/2 cup or so next time — or try the real deal! Flavor-wise, this one was stellar, as usual. Thanks, Tieghan! Hi Martie! I am so glad you loved this recipe and I hope it turns out better for you next time! I finally had a chance to make this tonight in the pressure cooker. It was so good. I did take out some of the sauce to make a slurry with corn starch to thicken it a bit. My chicken breasts were huge, so I cut them into pieces about the size of thighs. Perfect melding of flavors. I see looking at your pictures now, that I chopped mine much smaller. I’ll make them larger next time, and probably add more carrots. Mine didn’t turn out as rosy as yours, but I used a Pinot Noir and maybe that was why. I’m sure I’ll make this again. Hi Betsy! I am so glad you enjoyed this recipe and I hope it turns out better with the changes next time! Thank you so much! This was amazing! I followed one of the reviewer’s suggestion to boil the wine for 15 minutes if you’re concerned it’ll taste like alcohol. We were pleasantly surprised with how beefy this dish tastes for being a chicken dish. Used cornstarch to thicken, the sauce was a wonderful gravy for mashed potatoes. We’ll absolutely make this again, thank you! I am so glad you enjoyed this, Chrissy! Thank you! Thank you for this recipe! I had never made (or eaten!) Coq au vin before, but your gorgeous photos made me want to try! I used boneless thighs and didn’t have any bay leaves or fresh thyme, but it was still excellent. My sauce wasn’t nearly as thick as yours, so I used a little corn starch. Everyone enjoyed and I will certainly make again! I am so glad you decided to try this and it turned out amazing for you, Molly! Thank you!! Hi can you do with thighs? I guess boneless and skinless? Every single recipe I make of yours is BOMB but this might be the best thing I have ever made (from any recipe!). I skipped the mushrooms but otherwise followed your recipe to a tee… Thank you so much for sharing your talent with an amateur cook like me (although this recipe will make me seem not so amateur-ish anymore!) <3 Also thanks for posting intstapot recipes… I have had a lot of "flop" instapot recipes via pinterest from other websites and it's so nice to know yours will always be amazing! Hi Ally! I am so glad you have been loving my blog and recipes! Thank you so much and I hope you continue to love all of the ones you try! Made this in the crock pot and couldn’t be easier! The flavours were excellent and the chicken moist with mashed potatoes for a cold, winters night. A few notes – in the recipe it does not say to put the bacon aside so I put it in the crock pot with onions, garlic, etc. When I got to the bottom where it said ‘add reserved bacon’ I was like what?! I’m sure it would have been better to add it back in. Another note, when you make it in a slow cooker and reduce it at the end to thicken it (with the slow cooker you need to reduce for 30 minutes to make the sauce thicken), keep in mind that reducing does make the dish saltier (liquid evaporating and leaving the salts, etc). So next time I likely will just reduce for 10 but add in a cornstarch slurry. It was a hit with everyone! Hi Alison! I am so glad you loved this recipe and it turned out amazing for you! Thank you! This looks absolutely delicious! I am going to make it. I cant wait to taste it. I just want to ask you what other vegetables would work in this recipe instead of carrots and mushrooms? Another Half Baked Harvest hit! Thank you! So east and absolutely delicious. I made it on a stovetop and I did let it simmer a while. Mashed potatoes and arkmsavoy cabbage made it a really comforting dinner. Question for you. Do you cut up your chicken breasts or put them in the pot whole? What can you substitute for the wine that would make this Whole30 compliant? Any recommendations? I’m assuming the wine is more for the acidity, less than just a required liquid component… any insight would be helpful because I’d love to try this recipe!! I made this recipe last week and it really is SO tasty! I was skeptical about how it would come out being made in the instant pot, felt like it wouldn’t be enough time to meld all the flavors together but I was really wrong. Lovely gravy, and amazing depth of flavor. I served mine over mashed cauliflower so that I could get the effect of eating over mashed potatoes but without some of the guilt. Another excellent recipe Tieghan! Thank you again! Omg so super delicious! i made this tonight and will make it again later in the week when my daughter comes home for spring break. Thank you so much for the quick and easy recipe that hits the spot for the perfect Sunday dinner! Tieghan, in answer to the question about what you could substitute for bacon – Beef Frye, which can be found in the Kosher refrigerated department, looks, cooks and tastes just like bacon, but is all-beef. I can’t wait to try this recipe; it looks so delicious!